This is so easy and delicious, when its warm out of the oven, there's nothing better. Combine banana, dates, oil, cinnamon, vanilla, eggs and baking powder into a blender or food processor and blend until creamy and combined - alternatively you can do this by hand in a large bowl. This is the best recipe and tasting pulled pork i have ever had!! (yes i am a little bias). I love using the slow cooker to achieve the best results, add some homemade coleslaw and wraps/brown rice/quinoa/sweet potato wedges and you've got a delicious meal. How easy is this? I had no idea.. I will never buy Granola again. I measure my nuts and seeds by a handful, up to you if you want more or less of them. You can use any of your favourite nuts for this, good to switch it up. Serve it with Coconut Yogurt, Fresh Fruit or Nut Milk. Put all the ingredients in a bowl and mix together, Spread it all on to a baking tray with baking paper and bake for 20 mins on a 200C (pre heated). It's that easy! Veggie Crackers made from Juice Pulp! I usually compost my pulp left over from juicing but this is a new and utterly amazing way of re-using your pulp and turning into something quite spectacular! Mix all the ingredients together in bowl and then flatten it out on a cookie tray, cut lines on them to make them into squares. Bake in Oven for 30 mins each side on 180 degrees, check frequently. Make sure you flip them over after 30 mins.. Simply Delicious! This salad is so delicious, easy to make and super healthy. These are Amaze Balls.. So Yummy! Put Cashews in food processor, add Juice, Peel, Cacao and Chia Seeds and blend it all up until it goes into a smooth paste, if you need to add some liquid, use C Coconut water and only add a few tbsp at a time, the mixture needs to be fairly thick and paste like. Put mixture in a bowl and put in fridge for a few hours or over night. Empty some Shredded Coconut on to a plate for rolling balls in. Use a tablespoon to get out the right amount of mixture and roll it into balls then roll into coconut and store in a container, i use grease proof paper as a lining. I have a sore throat and feeling like i could be getting sick, so i need to blast it away with lots of goodness. This was my first port of call.. A Winter Elixir with all the health benefit's of Turmeric root (in season AUS) , Ginger Root , Juice of a Lemon and spoonful of Bio Dynamic/Manuka Honey. So easy to do, depending on how much you want to make, you can cool it and put aside for later. Take the skin off the Ginger and Turmeric and cut into small pieces, you can do it roughly and squash it a bit too (like you would with garlic), put in a pan and add some boiling water, boil for 10/15 minutes. Squeeze the juice of 1 lemon and put to the side, strain the ginger and turmeric and remove all the pieces, add lemon to the mixture, pour into your cup and add a spoonful of honey of your choice, Manuka is best but i used a bio dynamic honey that we picked up from a local farm in Hunter Valley. I whipped this Soup up last night in 30 minutes and it tastes amazing. Super Green and healthy with a thick and nourishing texture. Spinach is in season, so take advantage, try and buy Organic if you can. Put Onion, Celery and Zucchini in deep pan with some Olive or Coconut Oil and Mixed Herbs, cook for 5 minutes and brown all veggies. Then add the Cauliflower and cook for a further 10 minutes, boil the kettle and add some boiling water to the mix, make sure all the veggies are covered and there is some excess water but not too much. Add Veggie stock cubes and a good pinch of salt and cook for a further 15 minutes until all veggies are soft, then add the washed Spinach (2 large bunches or 3 small) into the pan and let it wilt for a few minutes. Blitz it all up with the hand blender and you will get this fab green coloured soup.. add salt and pepper to season and parsley to garnish.. serve warm.. I'm sure you will keep coming back for more! Delicious..
Let mixture sit for 10 minutes or put in fridge to cool. 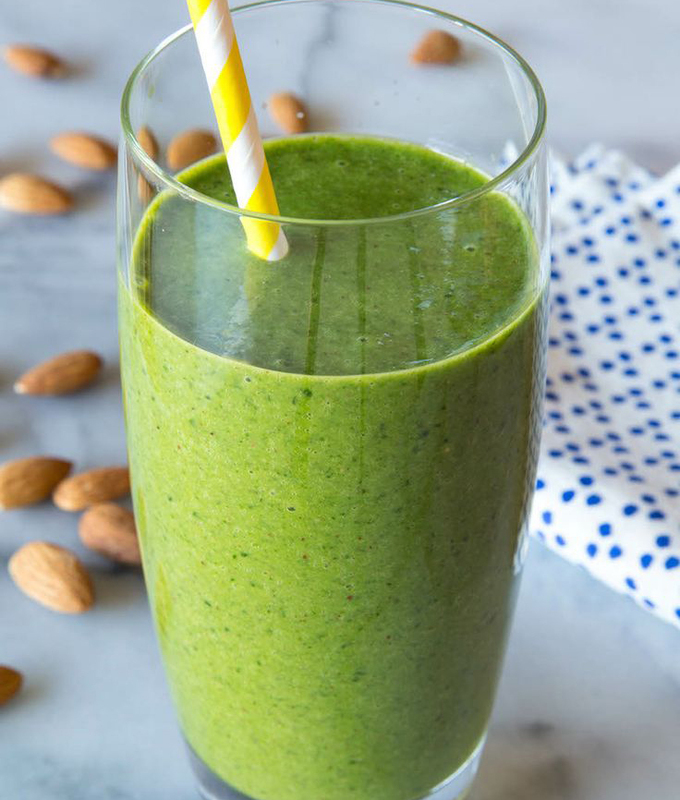 Add one tall glass of coconut water into blender - Add all the ingredients together and blend it up until smooth and green. Yum! This really is the Elixir of life, a glass full of Goodness and Greenness. So easy to do at home if you have a juicer.. TIP 1- Clean the juicer immediately after and it is less of a mission.. if you leave it, everything sticks and it is a major hassle! TIP 2- Put the Kale and Spinach through first and then juice other veggies.